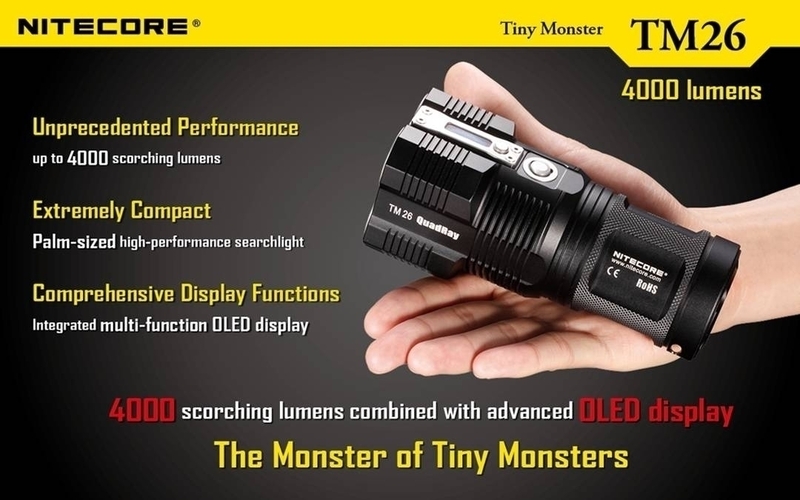 The TM26 is a compact beast of a light with an incredibly bright maximum output of 4000 lumens - the smallest 4000 lumen light available. 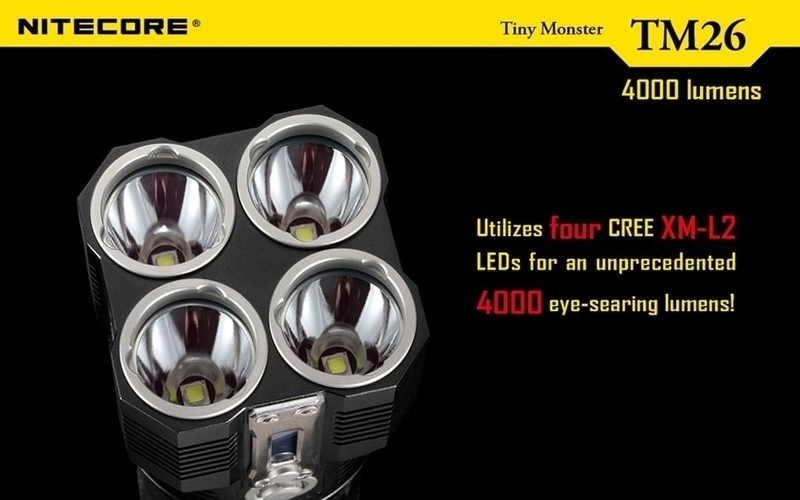 Combining the power of four CREE XM-L2 U2 LEDs, this light has an impressive peak beam intensity of 51,600 candelas and makes an amazing search light. 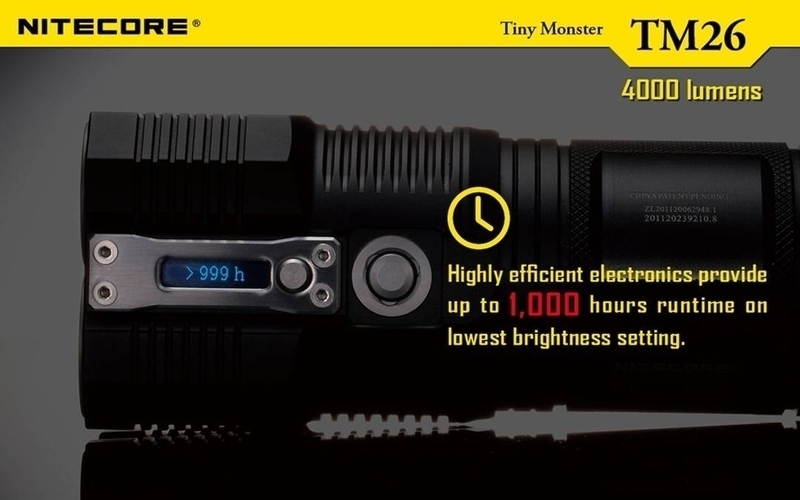 The unique mode selection button allows for easy access to all five brightness levels and the OLED display keeps you informed of battery voltage, battery status, approximate runtime and temperature as well as lumen output and brightness level. 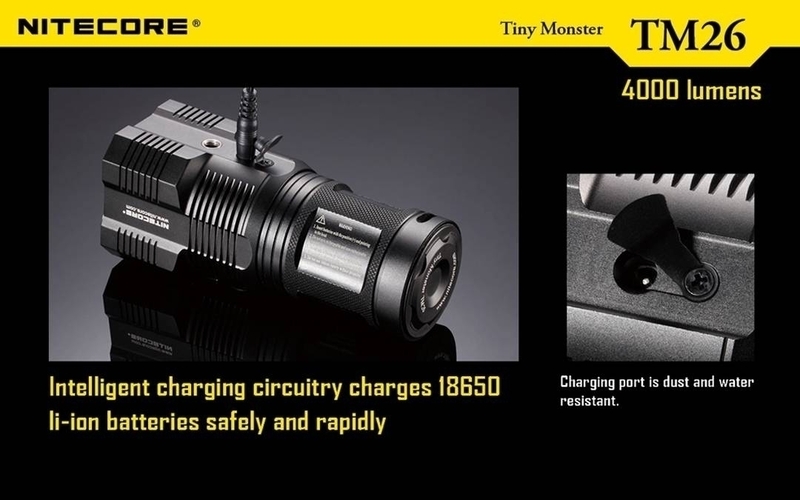 Combine this light with Nitecore's NBP68 Battery Pack for extended battery life! 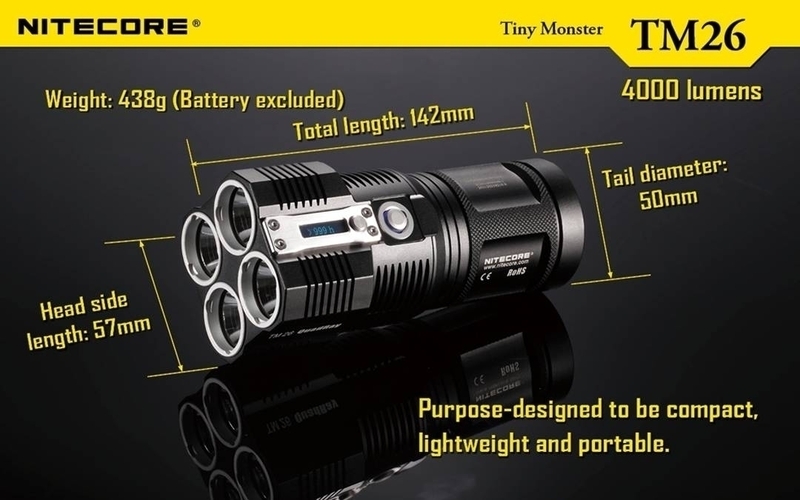 Package Contents: Flashlight x 1, Holster x 1, Lanyard x 1, Spare O-rings x 2, Charger x 1. 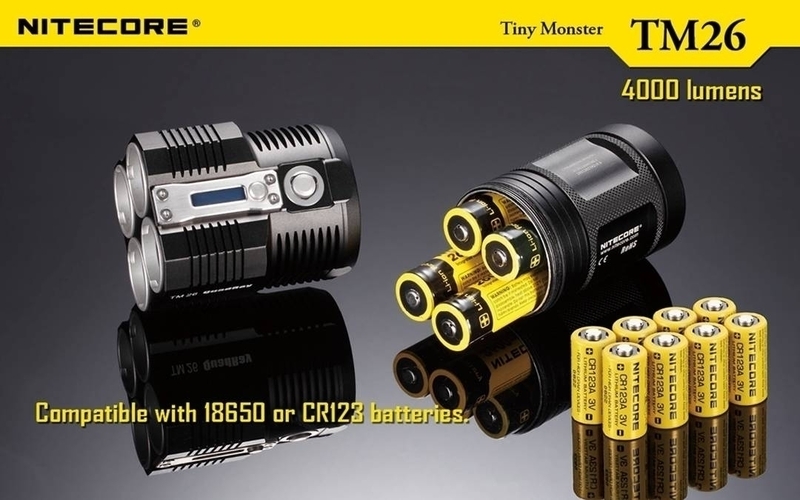 Operations: TM26 switch works the same way as other TM series products TM11 and TM15. 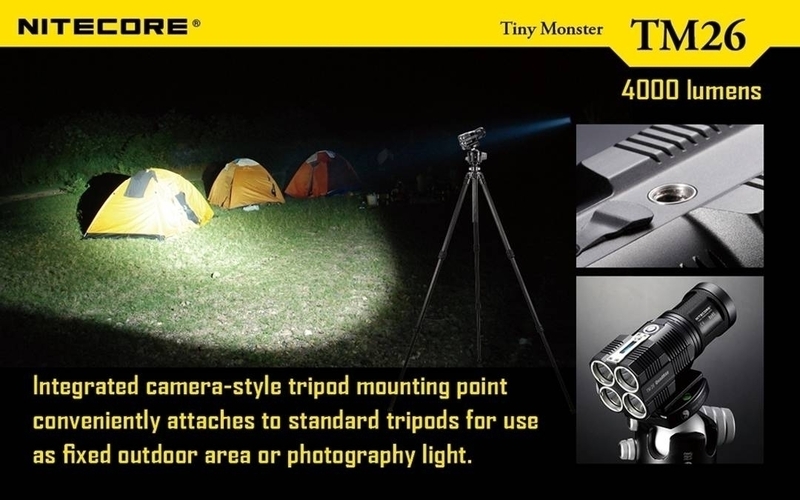 Note: The TM26 utilizes a 2-stage switch similar to a camera shutter button. 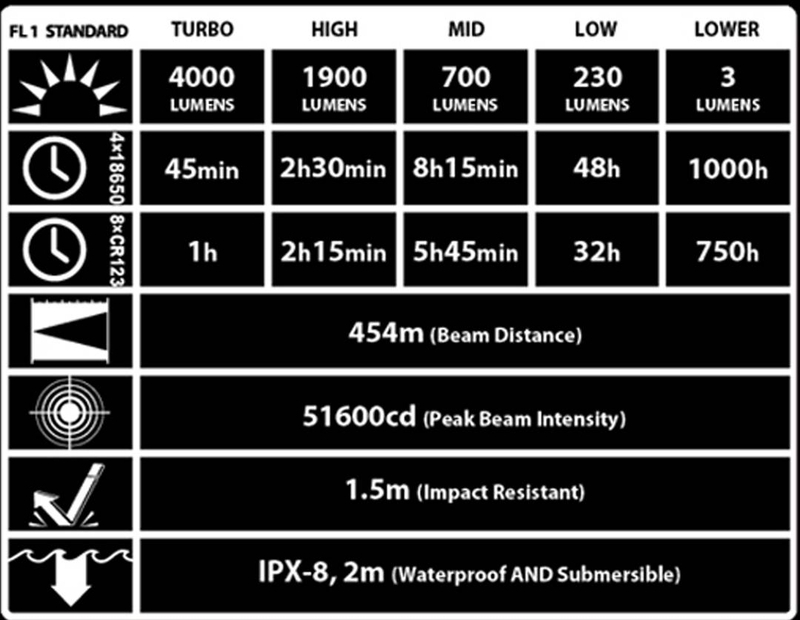 The light's numerous functions are selected according to the depth the switch is pressed. 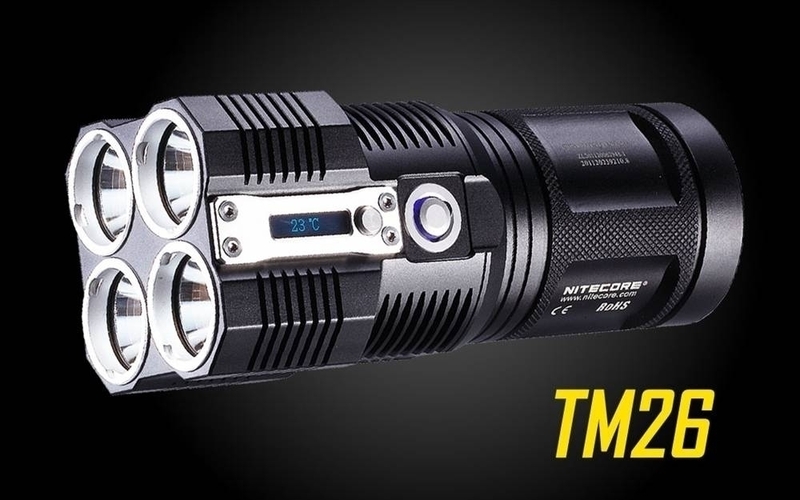 The TM26 has two modes: Daily mode and Turbo mode. While the light is off, pressing the switch half way down enters the Daily model. Pressing the switch half way and hold enters momentary turbo mode, i.e. light will be off when the button switch is released. While the light is on, press switch half way down to select a brightness level, cycle through ultra-lo, low, medium and high. Releasing the button will select and memorized the current brightness setting. While the light is off, pressing the switch all the way down enters the turbo mode. A second half way pressing on the switch reverts to daily mode at the last set brightness level. Pressing the switch all the way down and hold enters momentary turbo mode, i.e. light will be off when the button switch is released. While the light is on and in turbo mode, pressing switch half way toggle between high and ultra-high brightness. 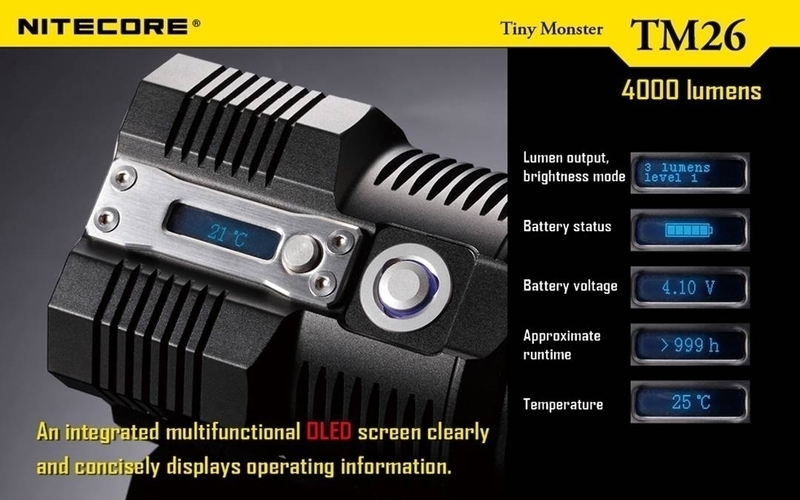 The OLED display activates automatically when the light is turned off and display lumen output, brightness mode, battery voltage, battery status, approximate runtime and temperature. After displaying this information for several seconds the OLED display will be turned off. The display can be reactivated by pressing the display switch and the information can be cycled through with subsequent presses of the switch. 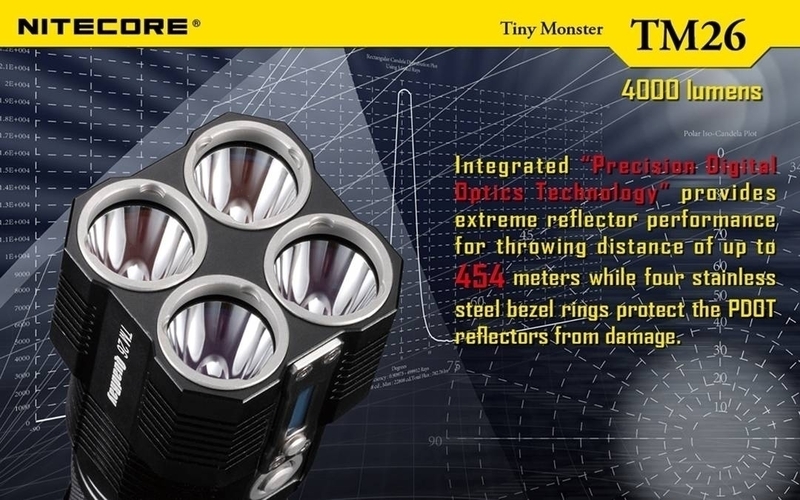 Note: The TM26 has an integrated thermal protection circuit which prevents overheating. 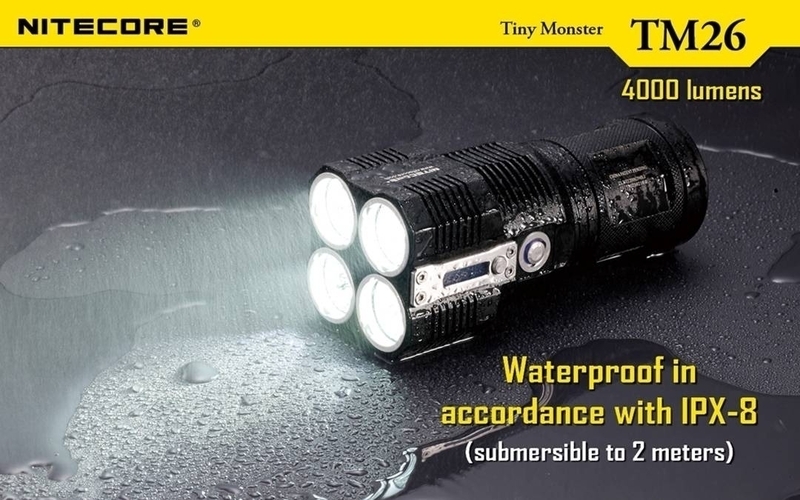 Please refer to the "Thermal protection" section of in the manual for details.